← A Government of Implied Powers? The President’s got some s’plaining to do !! For those who’ve been following the Embassy attacks of 9/11 and then the assassinations of ambassador Chris Stevens, his computer aid Sean Smith, and 2 former Navy SEALS, Glen Doherty and Tyrone Woods, it was obvious that the President and his State Department were not on the same page. The statement released by the administration – The Embassy of the United States in Cairo condemns the continuing efforts by misguided individuals to hurt the religious feelings of Muslims….” – was quickly retracted by the White House. Libyan President Mohammed el-Megarif, Secretary of State Hillary Clinton, and many administration officials have described what happened in Benghazi as a terrorist attack, yet the President still refuses to do so. Our agencies had plenty of intel to indicate that our officials in the Middle East would be in danger come the anniversary of 9/11 yet they never thought to share it with the ones who were in harm’s way. According to senior diplomatic sources, as reported by UK newspaper The Independent and others, our State Department had credible information at least 48 hours ahead of the attack in Benghazi that Americans and American missions might be targeted. Not a single warning was given to our diplomats, no “high alert” status was announced, security wasn’t upgraded, and personnel movement wasn’t restricted. In the days leading up to the attack, ambassador Stevens notified the State Department that he feared there was a growing al Qaeda presence in Libya and even feared for his life. He believed that they were making him a target. Yet he was moved from the heavily-secure embassy in Tripoli to the unsecured compound in Benghazi, where he was a sitting duck for militants. To this day, the FBI has not been to the compound to investigate the assassination of Ambassador Stevens, Smith, Doherty, and Woods. We have been told that it’s too dangerous for them to go there. The FBI has yet to set foot in Benghazi. We have been told that it is too dangerous for them to go there. But we know that’s a bold-face lie. In just 3 days after the attack, CNN reporters had no problem sorting through the rubble that is now the US consulate. In fact, they found a hard cover journal containing 7 pages of hand-written notes by Ambassador Stevens (documenting his anxiety and suspicions). 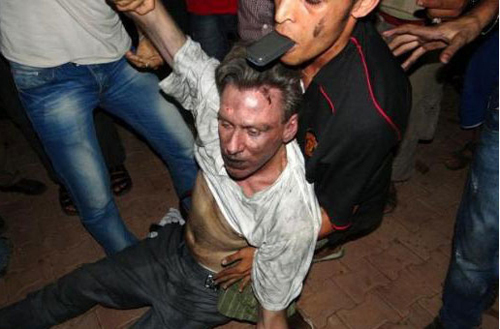 The journal revealed that he was aware of, and worried about, “the never-ending security threats” that he was facing in Benghazi, and specifically about “the rise in Islamic extremism” and “growing al Qaeda presence in Libya,” and “being on an al Qaeda hit list.” One has to wonder why the State Department didn’t do more to protect Ambassador Stevens and other U.S. personnel. [Perhaps it was a good thing that CNN found that journal before the government got its hands on it; otherwise, we would never have learned that Stevens feared for his safety and his life and the State Department had been aware of that]. I watch plenty of forensics and crime scene investigation shows and know that the general rule is that evidence is destroyed after 24 hours. By its absence, the FBI has made a decision not to investigate the death of our men. Low-life scumbag drug dealers and gang members are afforded more attention when they are gunned down than our ambassador, our computer expert, and our ex-Navy SEALS. “On September 16th, Susan Rice, our U.N. Ambassador told us: ‘First of all, we had a substantial security presence with our personnel…with our personnel and the consulate in Benghazi. Tragically, two of the four Americans who were killed were there providing security. That was their function. And indeed, there were many other colleagues who were doing the same with them.’ Rice was speaking, of course, of Navy SEALS Tyrone Woods and Glen Doherty. It was amazing how the story evolved over 12 days. How did the State Department not know what its personnel were assigned to do? How was Secretary of State Hillary Clinton NOT notified immediately of the deaths of Smith, Woods and Doherty? (We all heard the reports that no one knew the whereabouts of Stevens for several hours). Wouldn’t she have gotten that “3:00 am phone call”? How was the State Department NOT quickly briefed on what happened as to the events as the violence unfolded? Glenn Beck has a theory. He believes Chris Stevens was a CIA agent and the administration is taking its time in order to cover up its complicity. [The gist of Beck’s allegation is that the U.S. government surreptitiously dropped weapons into Libya during the uprising against the Gaddafi regime, but with extremist forces moving in and Libya teetering on the edge of complete chaos, it needed to get those weapons out of the country before they fell into the wrong hands. That was why Stevens was in Benghazi: He brokered the original deal and so he was sent in, with CIA handlers, to clean it up]. Nineteen (19) days after the attack, Obama still refuses to use that language. “We now know that this administration KNEW this was a terrorist attack within 24 hours of the attack. The State Department, under the guidance of Hillary Clinton would have known FULL WELL who was or, was NOT attached to Ambassador Stevens’ security detail. That means that the State Department and thus, the administration, before making a single statement regarding this attack, would have known full well that neither Doherty nor Woods were attached to Ambassador Stevens. Is Obama waiting for intelligence to evolve or is he involved in a cover-up? While the Obama administration is calling it ‘Evolving’ Intel, I can tell you that what it really is — ‘DE-volving’ Intel. It’s scandalous. The American people are not getting the truth from this administration. They are hiding something. From this government’s involvement in the Arab Spring in Libya (and in Egypt as well), in the events leading up to the anniversary of 9/11, to the protests and attacks on 9/11 and the killing of Americans, and now to the suppression of information, the botched investigation, and refusal to acknowledge terrorist involvement……. the government is not being honest with the American people. In fact, it is acting as a rogue element, unanswerable to the American people and dedicated to a policy that will bring harm to us and to Israel, and will jeopardize our safety and security. It is emboldening our enemies, weakening our position, advancing the effectiveness of terrorism as a tactic, and putting the men and women who bravely step up to serve our country abroad recklessly in harm’s way. Mark my words.. the only thing that will come out of the TARGETED DEATHS of Ambassador Stevens, Sean Smith, Glen Doherty, and Tyrone Wells in Libya on 9/11 by Islamists will be the eventual censorship of free speech here in OUR COUNTRY. Pingback: Mid Week Links (Different Than Weak Links) | What Would The Founders Think?